I admit it - I am a total HaSangBeg fan. Years of watching runway have drawn me to those designers who can surprise me and this designer is the master. It is hard to get information on him. Go to his website and you can navigate your way through it, but I can't seem to find a BIO or a current collection page. In an internet search I finally found a write-up in the online version of Vogue London in 2010 that had at least some information. buy this in a minute! Beg worked as a stylist at Tank Magazine before feeling "culturally homesick" and moving back to Korea. There he dabbled with television presenting, later becoming creative director at Korean Dazed & Confused. As far as his entry into the fashion world, all I can find is this quote in the same article - " I have been enjoying and learning about fashion since I was 19 years old; from being a model, to an illustrator, stylist, creative director and as an independent fashion designer. It took more than 10 years until I found that fashion design is the most personal fashion medium." I still have so many questions and just not sure when I will finally get those answers - where did he learn to design, what has the journey been like, how does he approach inspiration, etc. I love a mystery and in the next few months hope to solve this one. In the meantime I want showcase the evolution of this designer at Vancouver Fashion Week where his collection has been on the runway 3 of the last 4 seasons. Enjoy! Vancouver Fashion Week November 2010 (photos by Peter Jensen Photography) - For Spring/Summer 2011 HaSangBeg offered both bright colour and structure. Fitted wovens offered clean silhouettes with draped knits a welcome contrast. I loved the strong, in-your-face palette and the way the knit strands were interwoven like tree roots. Vancouver Fashion Week April 2011 (photos by Dale Rollings) - Fall/Winter 2011 changed to sharper silhouettes. Never for the timid, these designs are meant to appeal to the young and bold. Colour blocking was a strong theme in this collection. Notice the shoulders and sleeves on the garment on the far left below and the sweater 2nd from the left - both interesting design elements not seen in ready-to-wear. Vancouver Fashion Week March 2012 (Photo by Dale Rollings) - I was so glad to see HaSangBeg back for Fall/Winter 2012 after missing last season. Again, he brought a new look to the runway to surprise us all. Still edgy, but messier - right down to the model's hair and make-up. 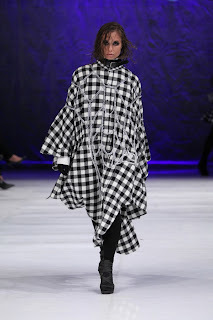 The theme this season was gingham and chains with a few pom-poms thrown in. From the time the first model hit the runway, the entire audience sat up. This was a show with a capital S and the fact it was unexpected made it all the more enjoyable. The palette was focused largely on deeper tones such as fuchsia, red, turquoise, purple and black. The chain used to make all the decorative elements also had it's own palette - silver, gold, red, turquoise and charcoal. Here are photos of most of the looks showcased this season. So ends another showing by HaSangBeg. I am determined to find more detailed information on this talented artist from Korea before he comes to Vancouver again - hopefully next season.